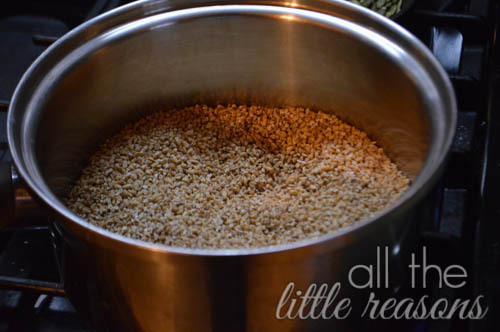 Start by toasting steel cut oats in the dry pan. I usually use medium heat and keep stirring them until they are fragrant and starting to brown. This makes it takes richer and more nutty. 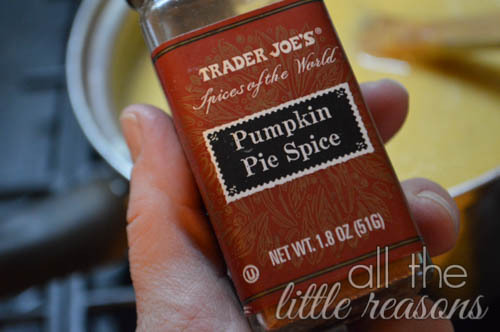 Add water, almond milk, pumpkin, salt and pumpkin pie spice. Bring to boil, then reduce heat for about 20 minutes. Stir often. 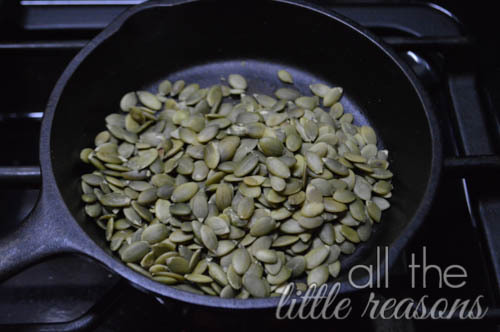 Meanwhile, toast pepitas in a small pan until they are making popping sounds and browning lightly. 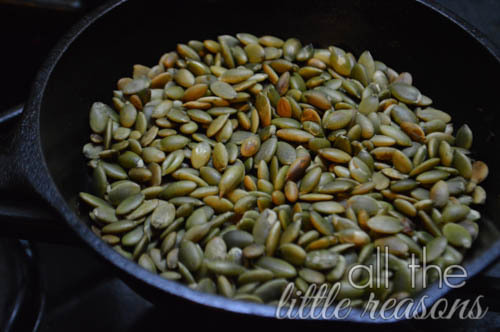 Have you ever had pepitas? They are great for people with a nut allergy because they are nutty and crunchy, but they are a seed – the inner part of a pumpkin seed. They are a bit pricey, but I buy them from our local Earth Fare in the bulk bins. Then I can buy as little or as much as I want. In the next few days I will post a delicious trail mix that uses pepitas. It’s SO good!! Some people like their oats more chewy. In that case, you may cook it less than 20 minutes. 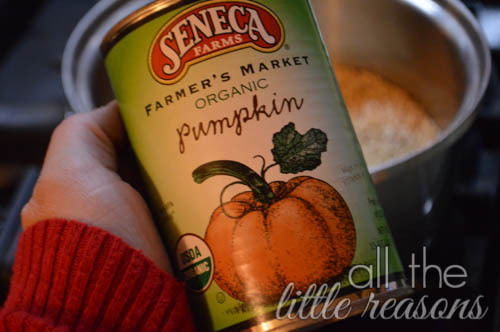 You could also make this the night before and put it in a crockpot on low. I used to cook it in the crockpot often, but I felt like it got overcooked and made a mess. I use a very small crockpot specifically for steel cut oats, but I’ve heard there are ways to cook it inside a bowl in a big crockpot. I should try that out and let you know! Top with toasted pepitas and real maple syrup. It’s so delicious! 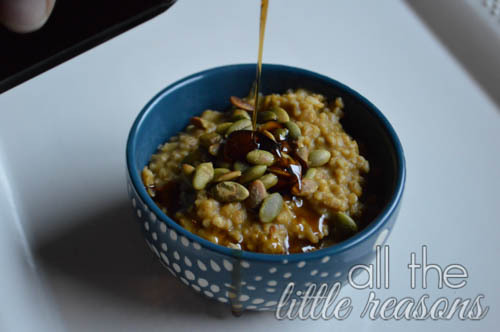 Toast steel cut oats in pan until they are fragrant and starting to get light brown. Add remaining ingredients except pepitas. Bring to boil. 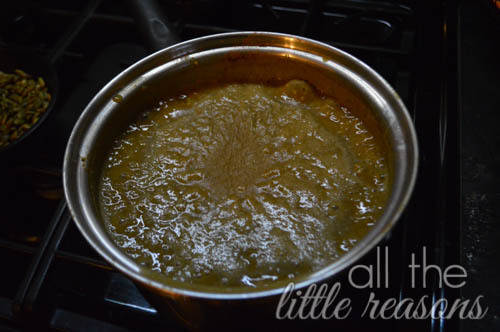 Reduce to simmer for about 20 minutes, stirring often. Meanwhile, toast pepitas in a small pan. It usually takes 5-10 minutes on a low heat. Take off heat when they are lightly browned and making popping sounds. 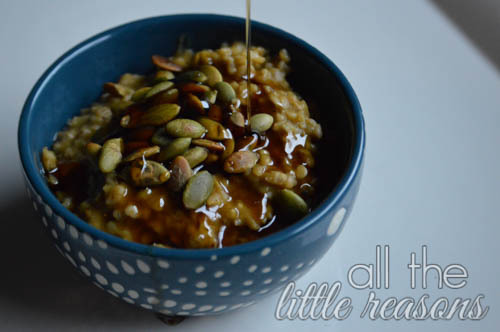 Top oatmeal with pepitas and maple syrup.